Summer in the Northwest wouldn’t be complete without an adventure into the great outdoors and a night under the stars. But getting back to our primal roots doesn’t mean we have to eat like cavemen. 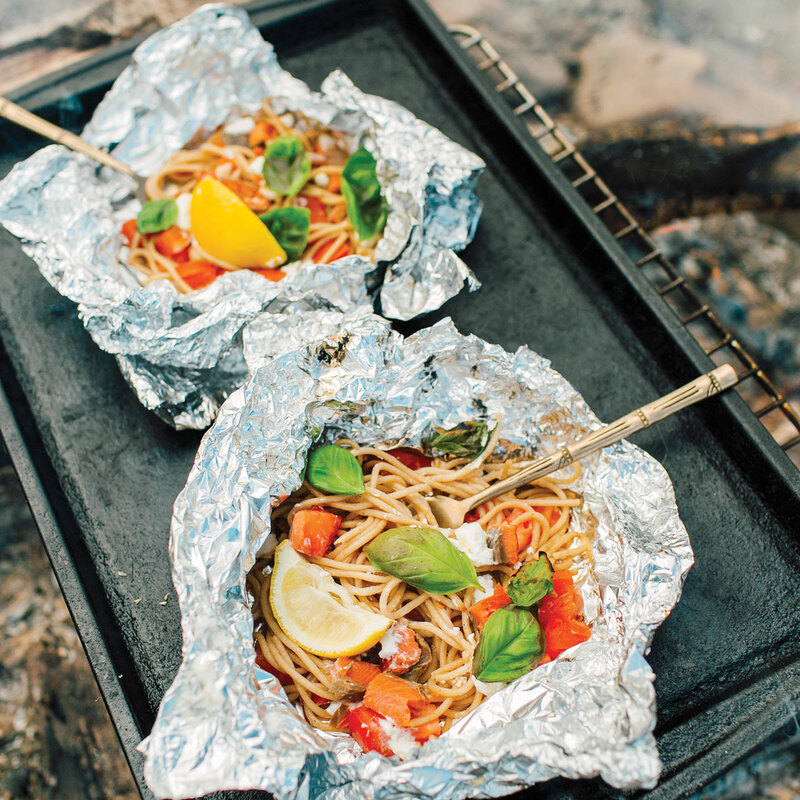 With a little prep work, you can upgrade your go-to camping meals from basic hot dogs to gourmet glamping entrées. Heat olive oil in large skillet over medium-high heat. Cook bacon until browned. Remove bacon from heat, dice and set aside on paper towel. Add frozen hash browns to skillet and cook for about a minute. Remove from heat and side aside. In a large bowl, whisk eggs. Pour eggs into the skillet and cook, stirring frequently until eggs are fully cooked. Add chilies, cheese, cilantro, bacon and hash browns. Warm tortillas in the microwave for easy wrapping. Add 1/8 of egg mixture down the center of each tortilla and roll up in a burrito. Wrap tightly in foil. Repeat with the remaining tortillas. Store in an airtight plastic bag in refrigerator or ice chest until ready to cook. 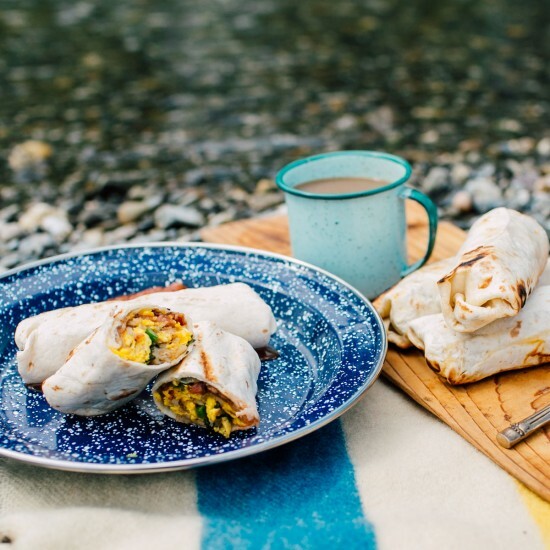 Place foil-wrapped burritos in hot coals next to the fire and let them sit for about 5-10 minutes, turning once. Check them often since cook time can vary depending on how hot your campfire is. Remove from heat and serve immediately. Cook spaghetti as directions specify. Cut 12 8″x12″ pieces of aluminum foil. In bowl, toss cooked pasta with smoked salmon, tomatoes, basil, garlic and a drizzle of oil olive until well combined. Place 1/6 of the noodle mixture in the center of cut piece of aluminum foil. Spoon a couple teaspoons of goat cheese on top of mixture. Squeeze lemon wedge on top before adding to the packet. Season with salt and pepper. Place another piece of foil on top of mixture and roll up edges to secure pasta inside. Repeat five more times with remaining pasta. Store foil packets in an airtight container in refrigerator or ice chest until ready to cook. Place a grill over hot coals. Place pasta packs on top of grill and cook for 5-10 minutes, shaking packets halfway through. Check them often since cook time can vary depending on the heat level of your campfire. Remove from heat when cheese is melty and pasta is warmed through. Serve immediately. In a large resealable, airtight container, combine fruit, 1/4 cup of sugar, cornstarch, cinnamon and salt. Shake until well coated. Place a grill over hot coals. 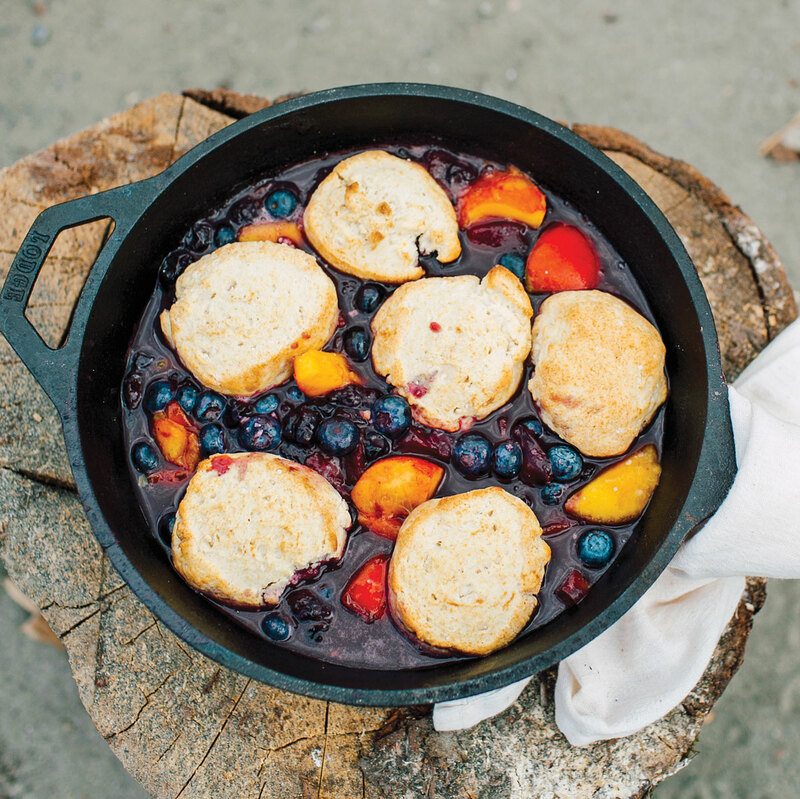 Grease Dutch oven and add fruit mixture. Combine baking mix and water as directed and knead until completely combined. Spoon dollops of biscuit topping on top of fruit. Sprinkle with 2 Tbsp of sugar. Cover with foil or Dutch oven lid and cook until biscuits are no longer doughy and fruit is bubbling, about 50 minutes. Let cool for 20 minutes before serving. Garnish with a dollop of whipped cream if desired.